Preignes le Vieux dates back to 1905 when great grandfather Robert Vic bought the estate. Today the fifth generation is now tending the vines on 250 hectares of land surrounding the château. The wine estate is situated at the north-west of Vias, separated from the sea by an old volcano, Roque Haute, here the vines grow in soil that is composed of basalt and volcanic ash. 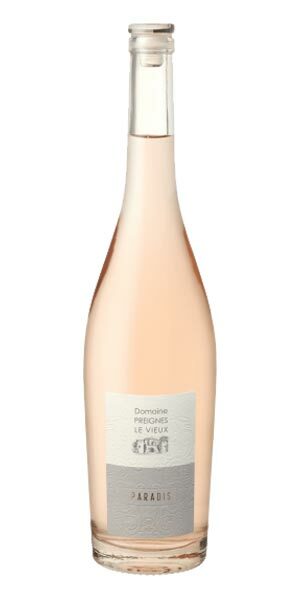 Paradis rose is 100% Grenache bearing the Pays d’Oc appellation of origin. The grapes are machine harvested and destemmed with partial carbonic fermentation occuring early during the fermentation process. The grape skins and juice remain in contact for no more than 8 hours to obtain just enough fruit and colour. Discover an expressive nose with notes of rose and ruby red grapefruit and a palate full of red fruit and refreshing minerality.